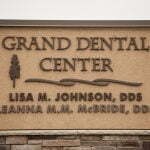 At Grand Dental Center in Grand Rapids, MN, we offer a variety of options available for replacing missing teeth. Dr. Lisa Johnson or Dr. Leanna McBride will perform a comprehensive evaluation to diagnose your specific condition and make recommendations for the best long term results. Our goal is to restore your smile to its natural function with optimal health and esthetics. Dentures and Partial Dentures: Dentures and partials can be a very effective solution for missing teeth. Used for centuries to replace missing teeth, today’s dentures look and feel more like natural teeth than ever before. Grand Dental Center offers a variety of dentures including implant supported dentures which offer better retention and long term benefits compared to traditional removable dentures.